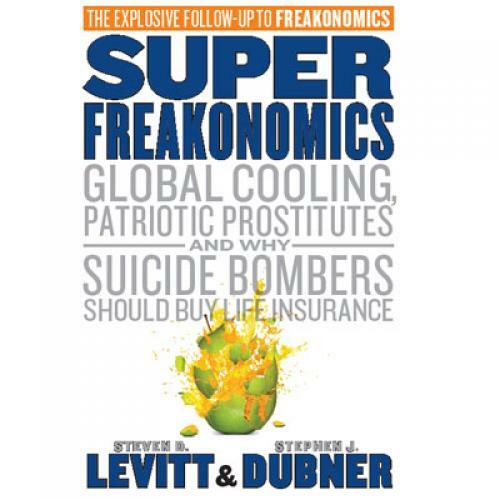 Does "Superfreakonomics" Need A Do-Over? 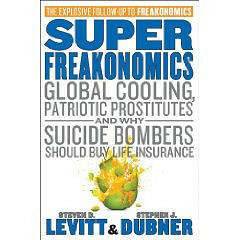 I enjoyed the original Freakonomics quite a bit. It surveyed some fun-to-read economic research that Steve Levitt had done at the University of Chicago, and while a lot of that work was employed in the service of trifling questions ("Do sumo wrestlers cheat?" "Do game-show participants discriminate? "), it was clear Levitt was a clever economist who could gin up fascinating "natural experiments" to crack open everyday mysteries. Diagnosis, in brief: (1) they write about stuff they clearly don't understand (2) they pick a catchy reverse-common-wisdom nugget as a headliner without the having the slightest interest in whether it is true or not (3) they pick an expert to talk to, but since they don't have a clue about the subject they don't know how to pick a good expert, or even understand what the expert says (4) there is a grain of sense in there, but so badly wrapped in trash it is nearly unfindable. In just a few dozen pages, Dubner and Levitt manage to repeat the myth that the scientific consensus in the 1970s predicted global cooling (quite untrue), imply that climatologists are unaware of the existence of water vapor (no, they're quite aware), and traffic in the elementary misconception that CO2 hasn't historically driven temperature increases (RealClimate has a good article to help with their confusion). The sad thing is that Dubner and Levitt aren't even engaging in sophisticated climate-skepticism here—there's just a basic unwillingness to gain even a passing acquaintance with the topic. You hardly need to be an award-winning economist to do that. What's more, as Joe Romm reports, the main scientist that Levitt and Dubner actually interviewed, Ken Caldeira, says they've completely twisted and mischaracterized his views—a glaring bit of journalistic malfeasance. And, as Matt Yglesias points out, one of Dubner and Levitt's arguments rests on the (demonstrably wrong and in any case wildly irrelevant) premise that solar panels are always black. Now, as a journalist, I'm all in favor of having people write about things they're not an expert in—and mistakes do happen—but this is a little absurd. Meanwhile, over at The New York Times website, Dubner is complaining that critics are all engaged in "shrillness" (without linking to any of the criticisms of his book) and appears to be quietly removing comments when readers attempt to point to Connolley or Romm's critiques. Guess they don't make hard-charging contrarians like they used to. Update: Dubner responds to the charge about twisting Caldeira's work, but doesn't address any of the errors that scientists like Connolley have pointed out. Maybe he'll get around to that soon.